Spearfishing fins come in a variety of colors and patterns, each of which is designed to camouflage the spearfisherman within his surroundings, making fish less conscious to his presence. 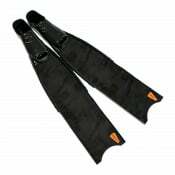 Spearfishing fins may be made of fiberglass, carbon fiber composite or 100% carbon fiber. Most spearfisherman choose fiberglass or composite fiber fins – since fiberglass is far more durable in spearfishing conditions than 100% carbon fins. Spearfishing fins might be subjected to hits or scratches from reefs and rocks underwater. Fiberglass and composite fiber spearfishing fins are built to withstand this kind "abuse", however 100% carbon fins, which are more brittle than fiberglass fins, may sustain severe damage in such conditions. 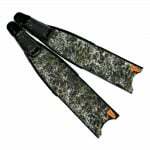 Therefore 100% carbon fins are great for any spearfisherman for blue water spearfishing and are only recommended for very experienced spearfishermen who spearfish in reef environments. What style of camouflage is best for me? If you spearfish mainly in open water environment, you can go with pretty much any kind of fin. 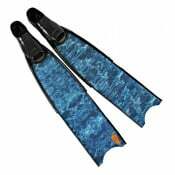 The best spearfishing fins for blue water are 100% carbon fins – they are extremely efficient in converting your energy to propulsion and won't be damaged easily in such an environment. If you are looking for a cheaper solution than 100% carbon spearfishing fins, any composite fiber / fiberglass fins will do the trick – there is no real need for camouflaged fins in a blue water spearfishing environment, so any single color fins will do (as long as they are not ridiculously bright colored - fluorecent pink fins would be a big no no). Depending on where you are globally located, kelp / alga will usually have a yellow-brown to purple-grey hue underwater. 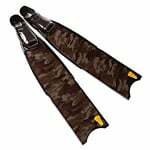 The best fins to help keep yourself hidden in such an environment are spearfishing fins with kelp / alga pattern in the appropriate hue for your hunting environment. Another good option for spearfishing in kelp / alga environments is to use single color yellow / white (translucent) fins, as they will also help conceal your presence and blend with your surroundings. For spearfishing in reef environments, 100% carbon fins should not be used unless you really know what you are doing! 100% carbon spearfishing fins can be easily damaged when coming in contact with rocks and reefs underwater. Our online support team will be happy to assist you with any further questions or concerns you may have. If you require any help or advice in order to select the best product for your needs, simply drop us a line at support@freedivershop.com or send us a message using the contact form on our site and one of our representatives will get back to you shortly.